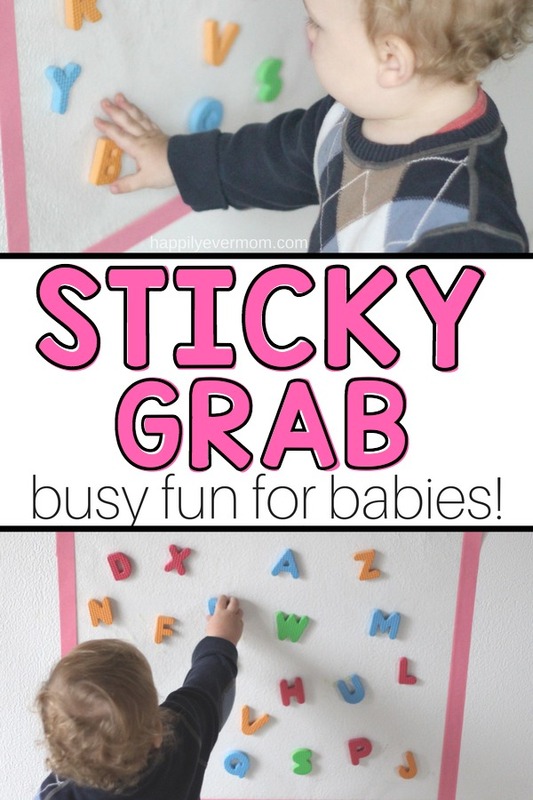 Sticky Grab: A Fun Activity for Baby that You Can Set Up in Minutes! 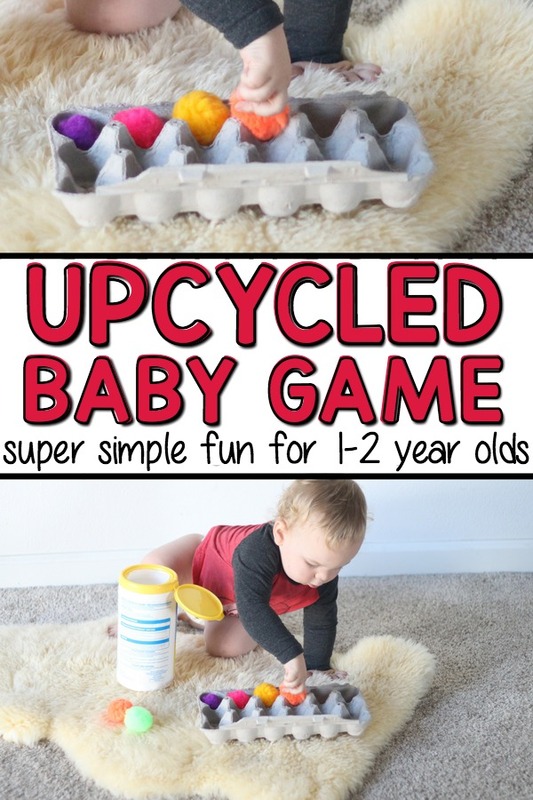 Need a fun activity for baby? You’ve come to the right place! 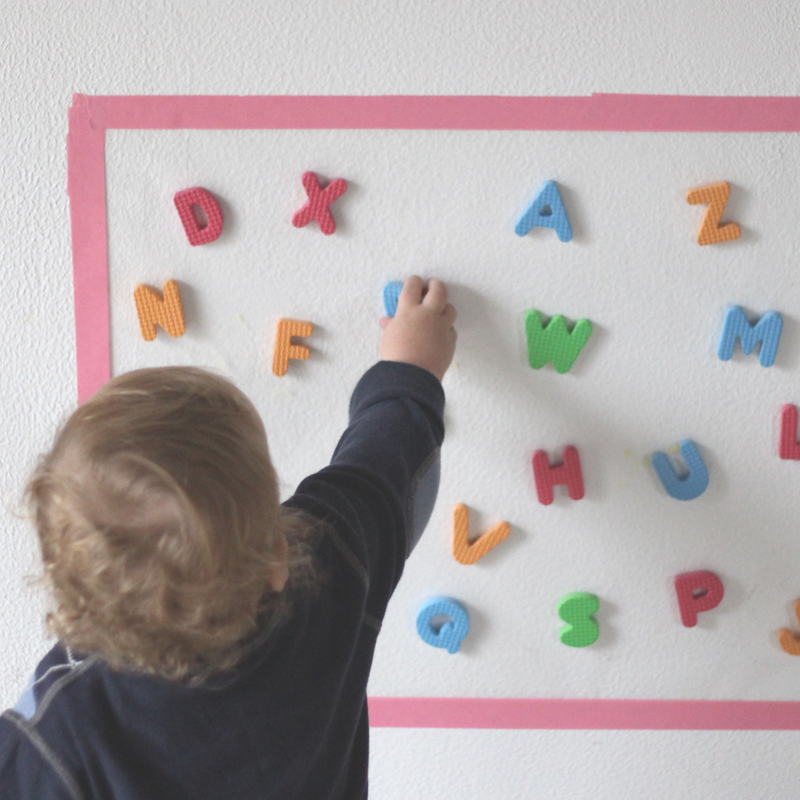 Inside this post, I’ll share exactly how to make a fun activity for baby with a sticky surface and foam letters. Your baby will love it! Ready for some easy fun? Let’s go! Full disclosure: I know it’s hard to see what’s going on in this picture. Don’t go clicking over to Amazon just yet, because those letters? They were a $1 find at my local K-mart. No Amazon purchase required (unless you want to). Before you start making a list of supplies you’ll need for this activity, let’s chat about why we do fun baby activities around here in the first place and how old my little guy is in the picture. 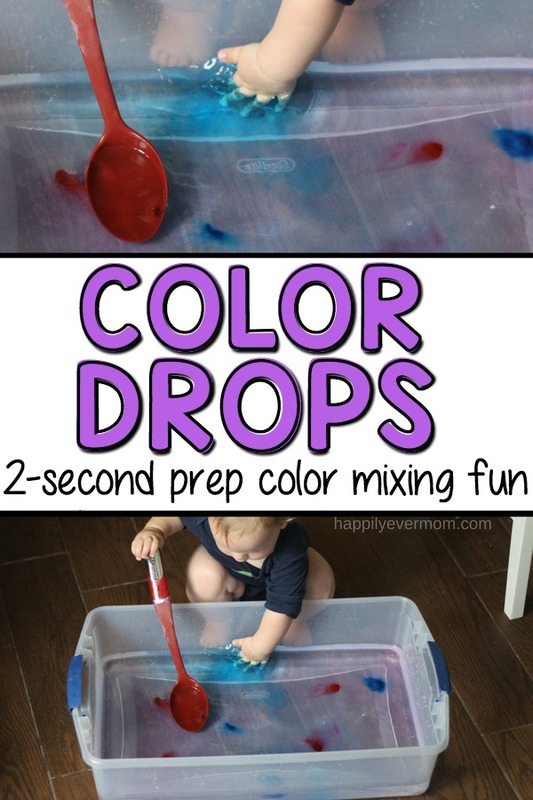 Plus, why you should do fun baby activities in your house too. What Are the Benefits of Doing a Fun Activity for Baby? Hand-eye-coordination as the baby moves their hand to grab a letter. Strengthening fine motor muscles as they grasp the letters. Sensorial experiences as they feel the sticky wall. And, retaining attention as they focus on grabbing multiple letters off the wall. That said, the mom in me wants to tell you that life is busy and it’s far too easy to turn on the TV, grab something blinky and/or noisy to “entertain” the baby, and completely lose our minds from the repeating blinks and sounds by dinner time. So, to be honest, the real answer is that these activities help to maintain my sanity at home with my kids, but within each activity are tons of amazing learning opportunities for kids. How Old Do Babies Need to be to do This Activity? I get asked this question a lot. Which is why I always include ages on all of my Instagram posts (psst…I post daily activities over there, so don’t miss following along). But, how old is old “enough” to do activities? In my opinion, it’s never too early do activities with babies! That said, you don’t have to go crazy. I spent most of my early days snuggling, nursing, and sleeping alongside my babies. So, don’t feel the pressure to do all the things. I like to do activities with my babies once they are sitting up because they are actively looking to play with objects around them. Note: In this picture, my son is around 14 months. But, this activity could be adapted for younger babies by lowering the sticky wall so a sitting baby could reach. While these activities aren’t hard to do or to set up, they do require us to think a little differently about how we “play” with our babies. Say goodbye to searching for “top baby toys” or looking for another crazy alligator push toy (although my son does love his); instead, you can go to the grocery store and the dollar aisle to entertain your baby. Are you willing to trust me on this?? This post contains affiliate links to Amazon. They’ll take you to the exact products that I recommend so you’re life is a little easier. And, no, there’s no extra cost to you for clicking on these links. Put up a sticky wall by using CLEAR contact paper. Remember how I said that you can find the sticky wall in the kitchen section of groceries store? You can find contact paper at the grocery store, but I grab mine at Rite Aid. You can also buy it here too. Peel back the paper on the back of the contact paper roll and tape a section to a wall or window nice and low for toddlers or slightly higher for preschoolers. Just make sure that the sticky side faces out. Use lots of tape here, don’t be stingy! Then, grab anything lightweight like the foam puzzle. Lightweight is the key term. If objects are too heavy, they will pull down the contact paper from the wall. Then, stick and *grab* the pieces off. You can also see it in action on Instagram. Take the letters down and then put them back up to repeat. You’ll see the magic right away after you play this game. 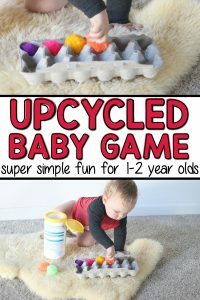 And, if you believe me that you don’t need more blinky toys to make your baby happy (or to drive you crazier), you’ll want to check out how we upcycled an egg carton into a baby toy. It has been a huge hit for tons of Happily Ever Mom followers who have tried it with their babies. Just see what moms have said over on Instagram! 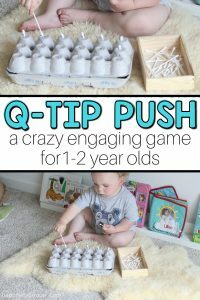 Need more Baby Activity Inspiration? You can see our 45+ baby activity list or a few of our individual posts below.